Speeches by the head and representatives of the FDFA on the subject of Agenda 2030. By spring 2018 the federal government will identify the areas in which there is a particular need for action to implement the 2030 Agenda. The reports and strategies that the Federal Council produces as part of work to implement the 2030 Agenda will be subject to a broad-based consultation process. 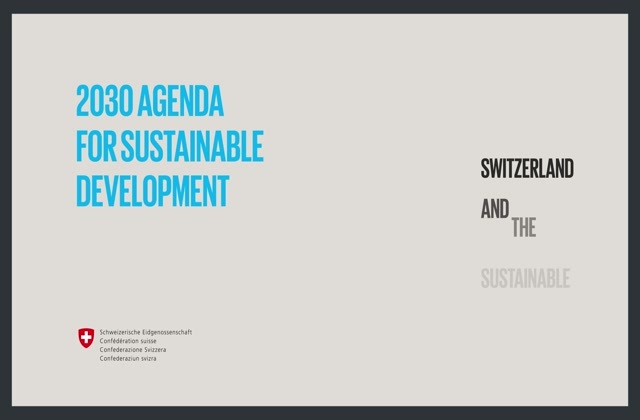 The 2030 Dialogue for Sustainable Development is the platform of the federal government to strengthen both the cooperation between the actors and Switzerland's implementation of the 2030 Agenda. Switzerland intends to strengthen the tried-and-tested partnership between governmental and non-governmental stakeholders in order to implement the 2030 Agenda. The 'Mainstreaming the 2030 Agenda in Swiss International Cooperation' concept paper is targeted at all Swiss development cooperation actors. A monitoring and review mechanism effective at national and global level has been established to achieve the Sustainable Development Goals of the 2030 Agenda. Switzerland is taking part in monitoring and international reporting on implementation, as well as in measuring the results of the 2030 Agenda. The 17 Sustainable Development Goals (SDGs), with their 169 targets, form the core of the 2030 Agenda. They balance the economic, social and ecological dimensions of sustainable development, and place the fight against poverty and sustainable development on the same agenda for the first time. The SDGs are to be achieved around the world, and by all UN member states, by 2030. This means that all states are called upon equally to play their part in finding shared solutions to the world's urgent challenges. Switzerland is also required to implement the Goals on a national basis. In addition, incentives are to be created to encourage non-governmental actors to make an increasingly active contribution to sustainable development.